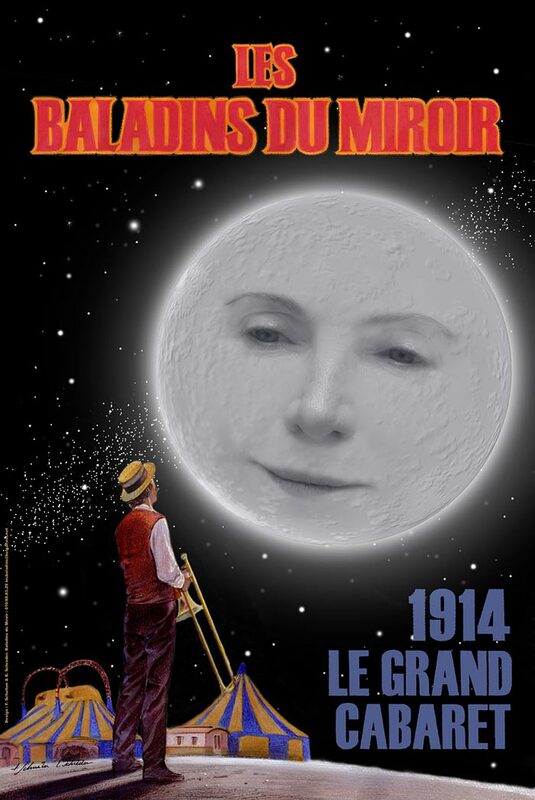 Les Baladins du miroir is a theater group that performed “1914, Le Grand Cabaret” in 2014. The show “1914, the Grand Cabaret” was created in 2005. In relation to the commemorations of the Great War, the city of Namur (Animation Citadel Committee) asked Les Baladins du miroir for a new version of the part. This time the story is set in Belgium and not in France. Original idea and directed by Gaspar Leclere. Screenplays by Vincent Zabus and Gaspar Leclere. Composition by Line Adam. The poster is made by Etienne Schreder and François Schuiten. Schuiten is also the artistic advisor of the play. At the end of the show a silent film by cinematographer Jean Cippolini is presented. It is a loosely inspired remake of “Journey to the Moon “by Georges Méliès. The Story Board is by Etienne Schreder. He also designed the decor together with Schuiten. François took also care of the costume design. Presentation "1914, Le Grand Cabaret"